My beautiful friend Katharine Horsman and I share a passion for vegan baking. After drooling over her Instagram posts — in which she oozes love for her craft — I suggested a dessert exchange. We’d each make a recipe, and then meet-up for a trade. I definitely got the long end of the stick. These are what she presented me with, wrapped up all pretty and everything. 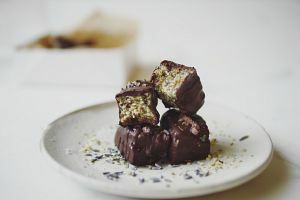 Sprinkled with fresh lavender and hemp hearts, they are moist, sweet-and-salty, raw, gluten-free, vegan, naturally-sweetened and seriously amazing. They’re a true ten-out-of-ten, and also very freezer friendly so maybe double the batch to have on hand for a hostess gift? Here’s the original recipe from unconventionalbaker.com. 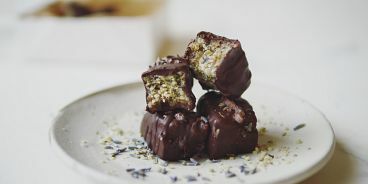 I don’t know all of Katharine’s secrets but adding lavender is one of them — highly recommend this flavour addition.